Why oh why am I bringing up Christmas so soon? I know this seems ghastly to some of you but here's the deal: I have a few Christmas titles to review and host giveaways for and I figured it would be in your best interest to mention them now so that if you win, you'll be in the best position to receive your winnings BEFORE Christmas actually arrives! (See, it's all about you, really!) Bear with me. I was sent a copy (and I did not resist!) 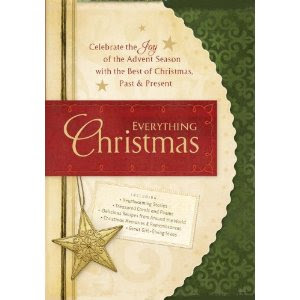 of Everything Christmas by Waterbrook Multnomah Publishing Group. This book is advertised as having "Everything you need to make your Christmas season merry and bright!" Now, that's a tall order but any tool that brightens the (already electrified) mood is a welcomed tool by me so I was eager to dive in and find out what this book had to offer. Each day provides variations on that theme, giving you plenty to dive into, sort out and play around with during the holiday season. There is even information about how Christmas is celebrated around the world, complete with traditional ethnic menus provided. It's just fun, that's what. Pure, undiluted fun that keeps you geared, focused and centered during this busy and blessed season of the year. Now for the good stuff, right? Waterbrook has generously offered a giveaway copy to one of our readers here at Reading to Know. If you would like to win a copy of Everything Christmas please simply leave a comment below. This contest will be open through Thursday, November 11th and is open to U.S. Residents only. THIS CONTEST IS NOW CLOSED. THE WINNER IS #1 - KATY. Without further ado - enjoy! Thanks Carrie! This looks like such a delightful book! Neat! A Christmas devotional! This sounds like a good way to stay focused on Jesus' birth and not the hustle and bustle! Ooh, sign me up! I'm ready for the Christmas spirit. Thanks, Carrie! Sounds like a great book ... I don't think it's too early to be able to get Christmas things but I do think it's too early for the malls and such to be decorated for Christmas. Thanks for the opportunity to win it! Yay! I'd love to hear your recommendations for toddler christmas books. Christmas already? Ho ho ho! I would love to win this book! Sounds wonderful! Wow, Carrie! This sounds great! I love Christmas and I'm always up for another idea to add to our celebration! My e-mail address is: sharen@neo.rr.com. Looks like a great book to pull off the shelf year after year. Trying again! This sounds like a wonderful book. I used to have a wonderful Christmas compilation book. I would love another one. The book in your giveaway looks like it has some wonderful Christmas themed writings. It does not seem to early for us! Ok, I WANT this book. Please add me to your list on the give-away. I really enjoy learning about the history of christmas and I would love to read this book. Great giveaway. Sounds like a great book for Christmas! Thank you! Oh, this sounds like a lovely book. thanks for the giveaway. Nice. I'm always looking for things to do with my six babies. Nice blog by the way. What a nice idea. I'd love to have a book like this. This book sounds wonderful, bursting with things connected to Christmas. Please enter me for this contest. you can never have too many christmas books! Ooh, I love Christmas books! Looks like a fun title. This book sounds great. Thanks for the chance to win! It's never to early to start talking about Christmas! Please enter me. Found you over at Semicolon Saturday Review of Books -- great review. I am going to order it today. I love Christmas and this book sounds wonderful. Thank you for the chance to win a copy. I've been trying to think of a way to do an Advent reading this year and this sounds like it might give some great ideas! This book sounds wonderful. I'm ready for some merry and bright! I'd love a copy of this book! I love Christmas, but have a hard time focusing during all the hustle and bustle. Thank you for hosting this giveaway, Carrie. I'd like to be entered, please. This sounds like it would be a wonderful gift for my daughter. Hope it's not too late. Everything is coming up Christmas already. Putting me in a festive mood. This book appears to be very classic and I like it. Thanks for the giveaway and the chance to win it. I hope I do! Sounds like a lovely book. Please count me in. Everything Christmas sound wonderful.Please enter me in the giveaway.Thanks for the wonderful giveaway.augustlily06(at)aim(dot)com.